MACOMB, IL -- The Eta Epsilon Chapter of Phi Beta Delta, an International Honor Society, is accepting applications for membership from qualified Western Illinois University faculty, students, alumni and community members until Friday, Oct. 5. There will be an interest meeting held at 4 p.m. Thursday, Sept. 13 in the University Union Boardroom. "I truly enjoy being around the dedicated, caring people involved with Phi Beta Delta," said Rich Cangro, president of Eta Epsilon Chapter of PBD. "There isn't a better time to get involved in all the wonderful things PBD does for our University community to raise the level of awareness and importance of internationalization at WIU and sponsor scholarship and camaraderie among faculty, students and the community." The aim of Phi Beta Delta and the Eta Epsilon chapter is to recognize and encourage high professional, intellectual, academic and personal achievements in the field of international education at WIU. The WIU chapter serves to encourage international programming and to promote the exchange of ideas and information among an interdisciplinary network of faculty, staff, students, community members and alumni involved in international endeavors by providing scholarships and promoting international community through various events. Completed applications can be submitted to Memorial Hall, room 347, or be scanned and emailed to PBD@wiu.edu. Student membership is $35 for the first year and $30 for each following year. Membership for staff, faculty, community members and alumni is $65 for the first year and $30 for each following year. 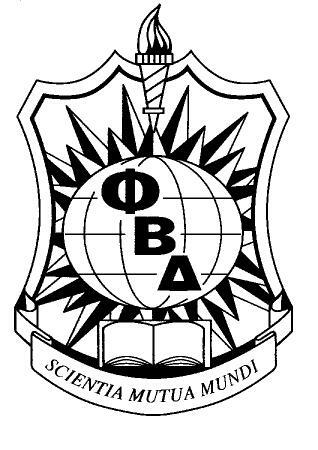 For more information on Phi Beta Delta and WIU's Eta Epsilon Chapter, or to find a membership application, visit wiu.edu/global_education/phi_beta_delta/index.php.